The scientific name for King salmon (also known as Chinook) is Oncorhynchus tshawytscha. Production of farmed King salmon in 2011 was 14,037 tonnes (harvested greenweight). 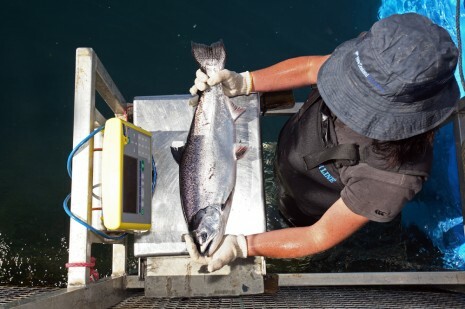 In 2011, 5,166 tonnes of King salmon was exported from New Zealand, earning an export revenue of $63.4 million. Most production originates from sea farms located in the Marlborough Sounds and Stewart Island. Freshwater farms are all in the South Island’s Mackenzie Basin hydro canals, and tend to be smaller than marine farms. King salmon take around 17 months to grow to market size. Depending on market requirements, the salmon are harvested at an average of approximately 3.5-4.0 kg.